Just a couple of photos to share today. They both date from 1975. The first one shows my three youngest siblings standing in our back yard in Detroit. 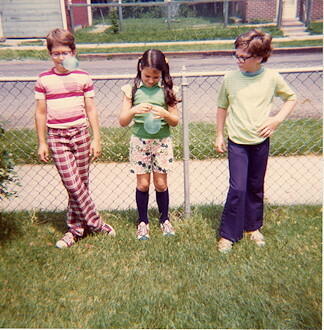 From left to right, their names and ages are Frank (10), Helene (8), and Greg (9). 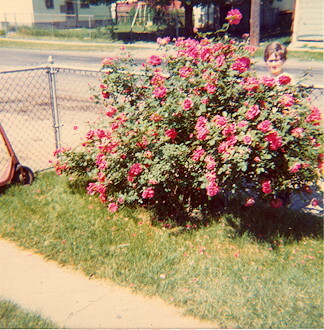 The other photo shows the Greatest Rosebush of Them All, which grew in our back yard. Oh, and that’s Greg again peeking out from behind. This bush was there when we moved into the house. It was typically covered with large, fragrant roses from spring through the second or third frost. It was just an awesome rosebush. Seems Frank was way ahead of the times here. The trend in fashion is to MIS-MATCH! Who'd a thunk it?